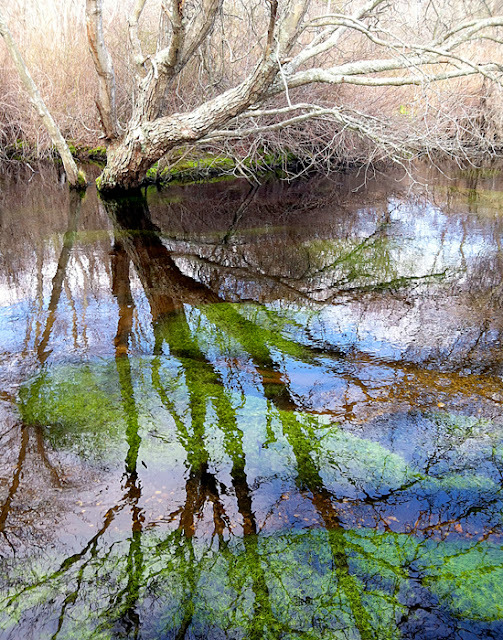 H: April 14, 2013: Yesterday, I met up with our club president, Linda Hotchkiss, for a tour of the Connetquot River State Park. The Juliana's Anglers will be holding their annual women's fly fishing school there in 2 weeks, April 26-27th. Gil, the park manager and only male (honorary) member of the Julianas, showed us around the main buildings. He's been taking care of this 3,473 acre nature and wildlife preserve for over 65 years. It's chock full of glorious history and Gil will happily tell all, discreetly. Originally the Southside Sportmen's Club, presidents, princes, chancellors, and captains of industry, have all fished and hunted here (not to mention numerous Julianas!). Linda shared some stories from the glory days when anglers would line up before dawn to secure the best beats. She spoke of previous Julianas' schools held here when the Connetquot was teeming with fish. Back in those days, you had to shove trout out of your way as you struggled to wade across the river unaccosted ;). Teaching students also proved to be quite difficult, when attempts to demonstrate the line mends required for the proper dead drift of a dry fly would be rudely interrupted, almost instantaneously, by an agressive take ;). Thick weed/cress beds and abundance of overhanging branches makes for challenging fishing on the Connetquot. A couple of months ago, the ladies asked if I would be interested in teaching casting at this year's school. After several early refusals, I finally agreed (took the bait ;). This will be my first official teaching gig. Yes, I'm nervous... but also excited to help new anglers learn this sport I love so much. It's a good thing I had a chance to scout things out (Thanks, Linda!). I had heard the Connetquot was a small, intimate "spring creek" but I saw firsthand on Saturday just how challenging the conditions are. There are trees and shrubs and overhanging branches everywhere! Add to that crystal clear waters, slow currents, and thick weed/cress beds and even an experienced angler, not to mention a beginner, will have his/her hands full. Forget overhead casting—there's no room for it, except from a few of the platforms. Accurate roll casting, a couple of singlehand spey moves, and a 4-weight outfit is all you need. Well, a few fish would be nice, too! There was no sight or sound of them on Saturday. Fortunately, I've had very little time to think (or worry) about my first teaching gig. Looks like I will finally be closing on my fishing shack later this week. Wish me luck in both endeavors!